This game was pretty unorganized. The beginning was okay, there were some good things, like the energy beams that were in the sand blocks. Now the mistake he made at the beginning was putting a jet pack there. I used the jet pack to go a little higher and viola! There was jet fuel. Now, if it was any other kind of power up, that would of been okay. But he had two jet fuels. That allowed me to basically roam around the map as I wished, making it super easy to get to the end. After I beat it once, I tried the game without the jet pack. But unfortunately, this elevator was blocking my path. Now I can't really do much. I roamed around the map as much as I could, and saw some good things. 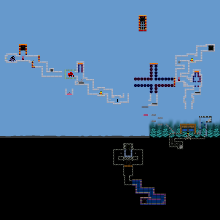 Like enemy placement and there was a tunnel of hotblocks underwater which is I really liked. If you fix the elevator blocking the path it will be fine. Why I'm not saying get rid of the jet pack is because you could make it into one of those games like Duck where you can head straight to the end, or see what the game has to offer. (Like an exploration game.) There's a teleporter right before the crystal to win the game too so it could easily be an exploration game.